Brigitte Ritschard lives in France in the Haute-Savoie. She has obtained a Master of Arts in Fine Art and is currently preparing a doctorate in Art. 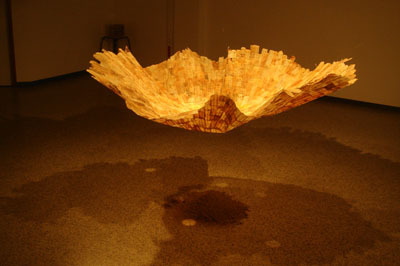 Since 2000, her work has centred around tea bags, focusing on both the container (tea bag) and the contained. Her research has led her to experiment and explore the possibilities within the material and its envelope: prints, assembly, fold and unfold. She took an interest in the progression of a vision centred on the enveloped object towards the enveloped human body. This memory-oriented work questions temporality as well as the body's instability. Eterni-tea is an installation built out of unfolded and reassembled tea bags. It reveals itself as a large sand timer: from this bowl the recuperated tea of used teabags trickles to the floor. The installation draws on the passage of time; the passage from life to death. Memorandum is an installation within which she shows a mould of her own body covered in unfolded teabags. The used bags retain the marks of the infused tea and the folds of the bag give the surface of the piece something resembling a mummy. 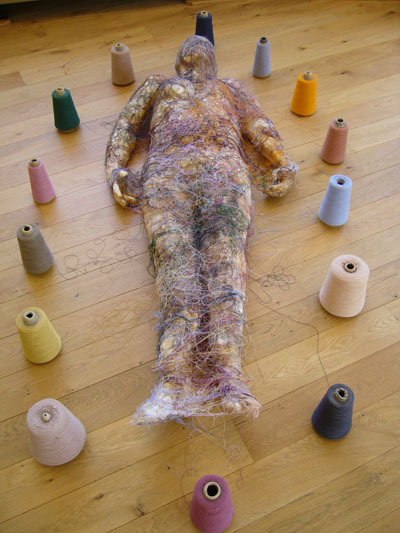 Surrounding the body are unravelled, entangled bobbins of thread: they symbolise the threads of destiny as well as all the connections that are to be created during life. May Be is an installation inspired by Samuel Beckett. It is made of squares of cotton placed on the ground in a way that resembles a chess board. On these squares moulds of fragments of the body are placed. Some of the squares are empty and evoke disappearance and the fragility of life. This installation is completely in white; for Beckett, white was the colour of disappearance.